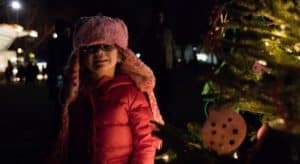 Mark Thursday, December 6 on your calendar, because that’s the day of this year’s annual Tree Lighting in Wilder Park. Bring the family to the park to enjoy all the holiday events. The annual holiday ceremony starts at 5:30 p.m. and is scheduled to wrap up at 7:30 p.m. Don’t miss this fun event. We know your family will have a great time. Everyone here at Elmhurst Toyota loves the tree lighting, and we encourage you to attend. Kids will have a chance to meet with a visitor from the North Pole. If you guessed it’s Santa, you’re correct! Elsa and Anna from the Disney film “Frozen” will be on hand to walk through the park and greet visitors. There will be free beverages and goodies supplied by Starbucks and Dunkin’. The Hawthorne Children’s Choir will perform many holiday favorites. To add to the Christmas spirit, you can bring a new, unwrapped toy to benefit the Toys for Tots program. You’ll find collection bins at Wilder Mansion during the Tree Lighting in Wilder Park. We expect a great turnout at the Tree Lighting in Wilder Park this year. Beautiful Wilder Mansion makes a wonderful backdrop for counting down the seconds until the trees are lit. A total of 60 holiday trees will be lit, each one decorated by different individuals and organizations. Of course, Wilder Park mansion will be open during the festivities. It’s an amazing evening you won’t want to miss! So, dress warmly and visit Wilder Park on December 6 to take part in this annual holiday tradition! The program begins with a holiday sing-a-long and the arrival at of Santa Claus at 5:30 p.m. and ends with carols at 7:30 p.m. Contact the Elmhurst Park District at 630-993-8900 or visit https://bit.ly/2BHmhg4.